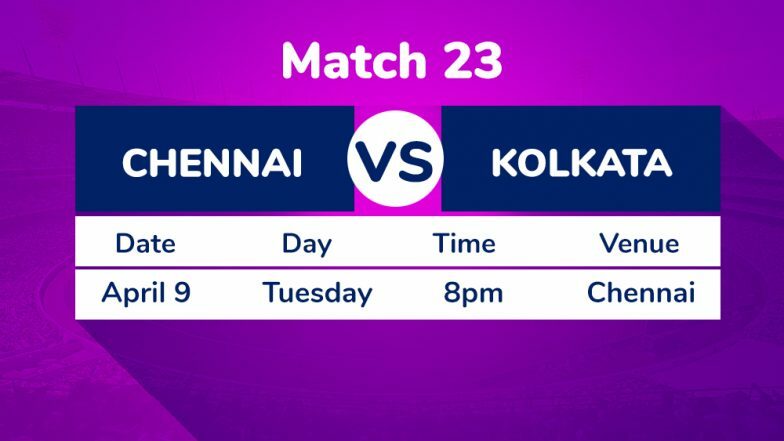 Chennai, April 8: In-form Chennai Super Kings (CSK) will meet a match when they take on Kolkata Knight Riders (KKR) in their Indian Premier League encounter at the M.A. Chidambaram Stadium here on Tuesday. While CSK have been at the top of their game at home, KKR are sitting at the top of the points table with four wins from five games. Although both the teams are equal on points -- eight apiece -- KKR have a better net run-rate of +1.058 over CSK's +0.159. CSK will go into the match with a lot of confidence as they defended a modest 160 in their last home fixture against Kings XI Punjab after the visitors looked like running away with the game at one point of time. In the end, it was captain cool Mahendra Singh Dhoni who showed great leadership skills to pull things back in favour of the defending champions. KKR go into the match after another clinical finish, as they walloped Rajasthan Royals by eight wickets in a one-sided contest. They first restricted Royals to 139/3 before chasing down the target in just 14 overs with Chris Lynn and Sunil Narine giving their team a flying start. Chennai Super Kings vs Kolkata Knight Riders Live Cricket Score 23th T20 Match. KKR's ability to shine on the slow Jaipur wicket will stand them in good stead when they take on CSK on what will again be a wicket on the slower side, as has been the case with the Chepauk tracks from the start of the tournament. The fact that KKR have the best spin line-up along with CSK will ensure that Dhoni & Co. would seek a track that is slightly more sporting. On their day, the likes of Narine, Kuldeep Yadav and Piyush Chawla can spin a web around the best of the batsmen and that will definitely be on the mind of the CSK think-tank. All in all, it will be a mouth-watering clash between two of the best teams in the league.